What could be more charming than a fat little Emery bear? If you're a new visitor to Virgo Moon you can search for Emery's name on my website with the search box on my home page to discover that I am partial to his bears! The Zuni Spirits portfolio (below) features Emery bears, as does McManis. This one is quite small, with gorgeous swirls emphasizing his pretty curves. His blue eyes are inlaid Turquoise. I find Malachite a difficult stone to design with because it is so strong. It seems like a little bit goes a long way, and it's challenging to find other stones which get along with it. Here I solved the problem by using small beads with bright spots of equally strong color. 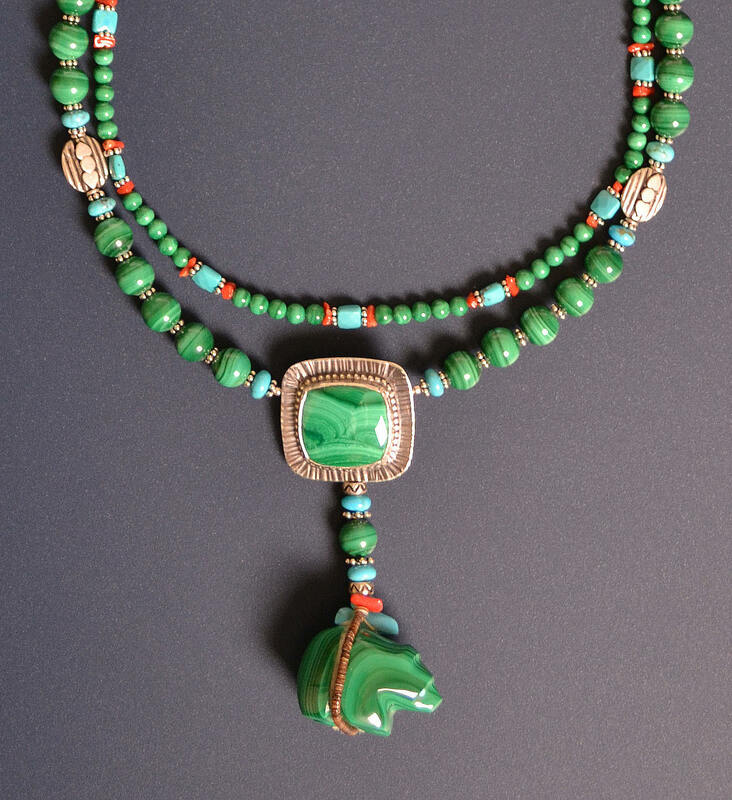 To find matching stones, I carried the bear to Tucson and sorted through large piles of Malachite cabs. Malachite, for all the difficulties it poses for the designer, is a fabulous stone to wear. Simmons is effusive about its power, noting that among its many qualities it is one of the most important stones for protection against negative energies. Of course Bear himself is the protective and healing animal of the West. Ahsian calls Malachite being a "powerful ally for those who are trapped in waiting for their reality to change." Looking around on Amazon for interesting information on Malachite, most of the titles (aside from fiction) relate to cleaning up toxic malachite green. 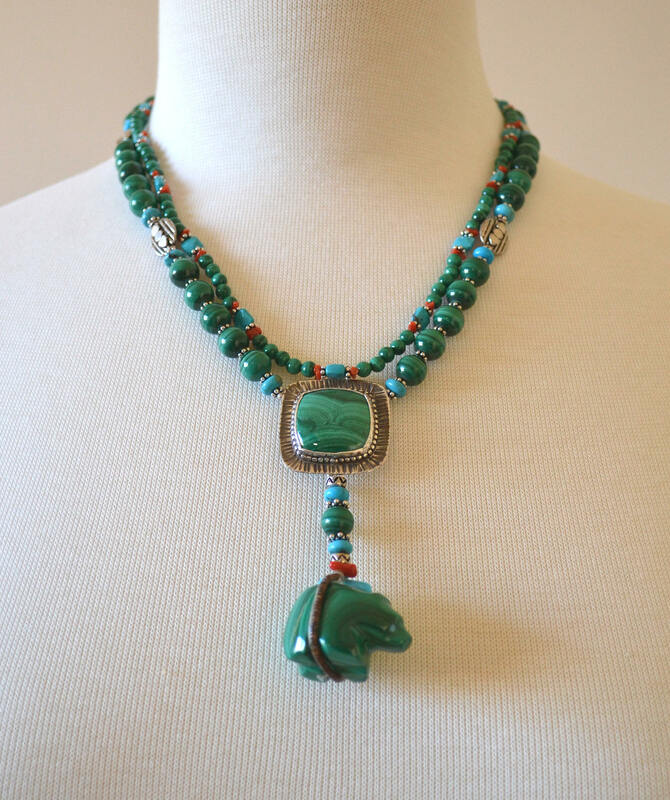 Don't be concerned, I've never seen any indication that there is a health hazard from wearing Malachite! Cutting and grinding it is a different matter, a respirator must be worn as the dust is toxic when inhaled. I ran across a mysterious Russian book called Malachite: Poetics of Stone/Chronicles Documents Commentaries. Unusual for Amazon, there is no author, no publication date, no ISBN number... only a price tag for a used copy of $1,200(!). Fortunately there is another entry (link below) with the correct title for the two volume set which gives more information and a somewhat more reasonable price. It sounds most interesting indeed! Russia holds a treasure trove of Malachite made from the Ural deposits. The famous "Russian mosaic" technique is the astonishingly time-consuming method which was used to make the 10 meter Ural Malachite columns in St. Isaac's Cathedral in St. Petersburg and other Russian wonders. 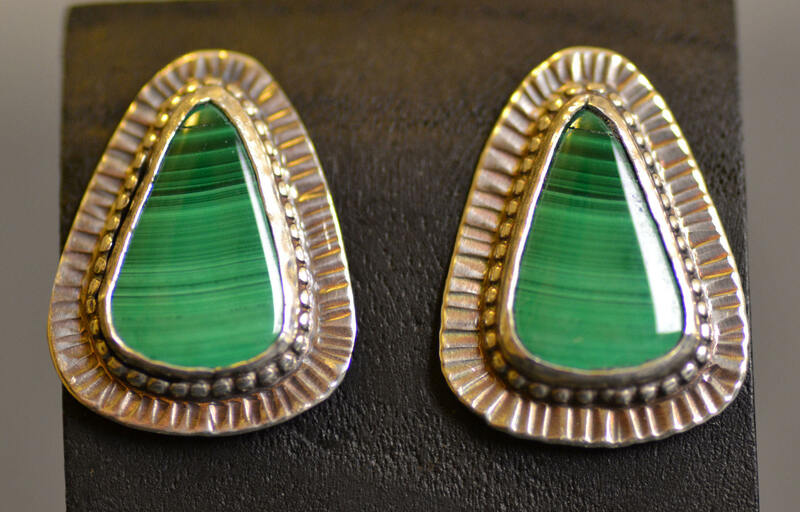 Today the famous Ural deposits are depleted and most fine Malachite comes from Africa though rockhounds in Arizona might find some as well. 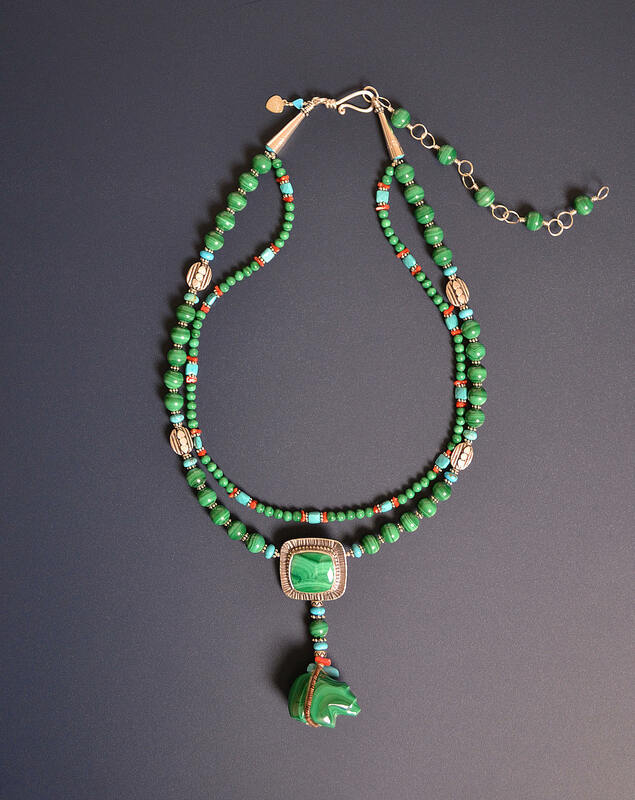 Malachite was known in ancient times and Kunz mentions the use of eye-patterned malachite to protect against the evil eye. We mustn't forget Bear himself! In addition to the Zuni meaning mentioned above, the Medicine Cards give bear 'Introspection' because of its annual hibernation. Andrews gives it the keynote of "awakening the power of the unconscious." The Druid Animal Oracle gives bear the attribute "Art" and mentions that "Art connects you with the very deepest of your ancestral roots." And if you love Bear, don't miss Brian Payton's Shadow of the Bear.